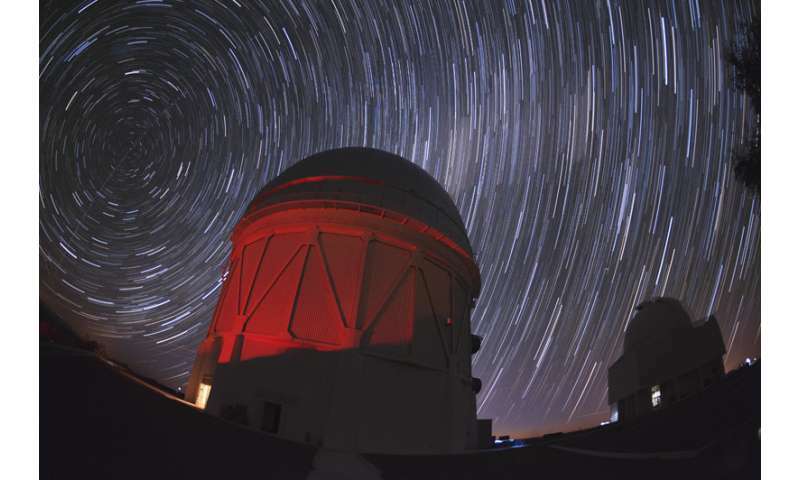 Three cosmologists from the University's Institute of Cosmology and Gravitation analysed new data to provide one of the most accurate measurements of the Hubble Constant to date. The Hubble Constant is the local expansion rate of the Universe and is the cornerstone of modern cosmology. This expansion was first measured by Edwin Hubble in 1929 and is known as Hubble's Law. A key part of this law is Hubbles' Constant, which represents the exact expansion rate now (i.e., how fast space is expanding in our local cosmic neighbourhood). To obtain this new measurement, the ICG researchers used a new methodology, the 'inverse distance ladder' method, to add new cosmological results using Type Ia supernovae from the Dark Energy Survey (DES) to existing distance measurements. Professor Bob Nichol, Acting Pro Vice-Chancellor (Research and Innovation) and co-author of the study, said: "We have used this new data, and new methodology, to obtain one of the most accurate measurements of this constant to date. In fact, I'm surprised how good it is. "Our value agrees with many others, but does not agree with the Nobel Prize winning astronomer Adam Riess and his team, which leads to some tension. Or it could be telling us that we don't really understand our local Universe, which would be fascinating." The study is one of eight new papers presenting exciting results from DES, and it was presented at a special DES meeting at the Royal Astronomical Society in London on 9 November. "Or it could be telling us that we don't really understand our local Universe, which would be fascinating." Above, the difference between how a scientist thinks vs. the moronic dribble posted here by the self proclaimed experts. The quote indicates excitement at the possibility of learning something new, as opposed to the kneejerk attacks from people who are being shown they might not know what they think they do and are scared shitless at the prospect. The introduction is a good read if you are really interested in the subject and what DES can do. ... the moronic dribble posted here by the self proclaimed experts. Yes, I'll take "Irony" for $500, Alex. missed-interpreting the researcher's speculations. flattired claiming a miracle confirms his delusions. DES is important because it uses multiple measures simultaneously from the same data. These are all collected from the same instrument using the same optics and the same CCD cameras. This instrument is the DEScam on the Cerro Tololo 4 meter Victor Blanco telescope in Chile at the Inter-American Observatory. This setup images a field over 3 degrees wide. Instead of traditional spectroscopy, DEScam uses a filter cartridge pack with five filters ranging from optical to infrared and shoots the same area five times, once with each filter. The original observations are complete; these are the first results of analysis of them. Of particular note, dark energy has been confirmed and its parameters have been measured. This was the original goal of DES, which stands for Dark Energy Survey. DES has detected 207 supernovae of type SN1a over its five-year observing program, among many other things. Instead of traditional spectroscopy, DEScam uses a filter cartridge pack with five filters ranging from optical to infrared and shoots the same area five times, once with each filter. Just a minor note that spectroscopic surveys aren't really more "traditional" than imaging surveys. An imaging survey like DES means you have more galaxies but you have a much poorer knowledge of the distances to those galaxies compared to a spectroscopic survey. DES was first and foremost a weak gravitational lensing survey, to constrain cosmology though cosmic shear. For that purpose more galaxies with poor distance is preferable. But DES also tries to do baryon acoustic oscillations in galaxy clustering, but because of the poor distance knowledge only some of the information can be extracted. Soon there will be DESI which will do much better with BAO as a spectroscopic survey. Imaging and spectroscopy are complementary. The obvious could not have been better said. Well done. Ah, the eagerly awaited DES 3 year cosmological results! DES provides data out to long distances. These results nicely test Planck's aggregated data, agreeing with the state equation parameter of the universe (DES −0.978 ± 0.059, Planck −1.04 ± 0.1) and its total matter fraction (DES 0.321 ± 0.018, Planck 0.3111 ± 0.0056). They can also exclude not having dark energy, i.e. they observe it for sure. As I understand it from a quick browsing, DES calibrates distances by using the absolute BAO distances for z > 0.1, then reconstruct the cosmic ladder distances 'inversely' back to us by backtracking with a generalized cosmologic behavior (taking a Taylor expansion of the data distance behavior). They get Hubble H0 = 67.77±1.30, Planck 67.37 ± 0.54 km s−1 Mpc−1. The inverse BAO method has been used before on other data, see the Planck and Riess et al for examples, and routinely recover LCDM consistent results. So far they have fewer Type Ia supernovae than Riess et al, some 200 vs several hundreds IIRC, but going out to long distances in one go. So what is wrong with the local universe or alternatively Riess et al using the old cosmic ladder method that has served us so well? We have seen that the local universe is a relative low mass bubble so expanding faster than Planck say, but that explain at most something like 1/10 (IIRC) of the tension. And real scientists have told you that EU/ PC is a load of DRIVEL. Funny how you ignore them when that happens, eh? Even Hubble wasn't convinced that the red shift data necessarily indicated that space was expanding. He thought there might be other possibilities worth exploring, changes in constants, etc. At this point, science has run the expansion theory to ground, and we are left with somewhat ridiculous patches that are bigger than the theory they support, from the cosmological constant to hypothetical "dark" matter and "dark" energy making up 90% of the universe. Might be time to examine some other theories that could account for the red shift data? There are none that stand a moments' scrutiny. C decreasing by 2 cm/s per year while holding photon energy constant completely accounts for the red shift. Could it be also the gravitational affect of our Hubble Sphere universe and adjacent Hubble Sphere universes cumulative and antagonizing affects to the redshifting of light that is causing this discrepancy in the values obtained for the hubble lemaitre law. Just so we're all clear, a changing speed of light is a standard argument of YECs. "Our value agrees with many others, but does not agree with the Nobel Prize winning astronomer"
I am not suggesting the earth is a few thousand years old as the so called "young earth theory" suggests. I believe that is rubbish as I have answered you before. Also YEC does not suggest that the speed of light is decreasing in transit, as I posit. C decreasing by 2 cm/s per year and holding photon energy constant at the time of emission accounts for the red shift data. I am also not suggesting I am necessarily right; just that the expansion model is broke and gone down a rabbit hole of hypothetical invisible stuff. Changes in the speed of light imply that energy is not conserved. Remember E=mc²? Maybe you've heard of that. There ain't no empirical evidence of the speed of light changing. Stop lying, @Jax YEC. PC's are real. I am using one right now. Pretending to know something does not mean you know it.